Ok so it looked like the BM thread was closed. I haven't seen Aquaman yet but my biggest draw to see it is actually Black Manta. I like that dude. He's smooth and hell and totally ruthless. Any thoughts on Manta? One thing that gets me is his outfit. I've seen him done really sinister and kinda hokey. He's pretty cool in the Aquaman movie but unfortunately he doesn't get a ton of screentime because I think they want to set him up to be the next movie's villain. His fight is way better than the fight against Orm imo. 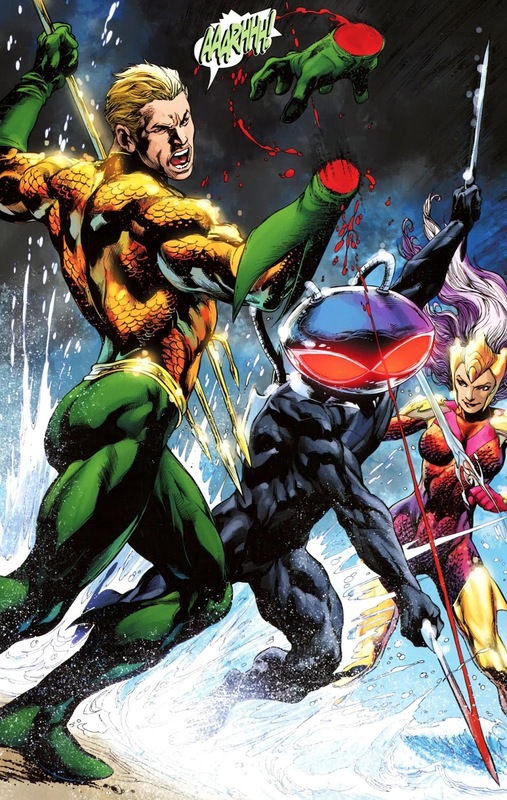 I actually dig manta's slim wetsuit but I think the YJ and Injustice versions are my favorite iterations. I think he looks more sinister when he's helmetless but Injustice 2 has some pretty awesome helmet designs. Last edited by lemonpeace; 01-02-2019 at 04:25 PM. John Stewart is my Lantern. I agree with all of this. Even down to not seeing Aquaman yet (I'll wait for the blu-ray, DCEU has let me down far too often for me to give them my money for their BO) but wanting to mostly for Manta. YJ cartoon is by far my favorite version. That guy was all kinds of awesome, like an underwater Darth Vader. I gotta say though, I've never felt like the character was fleshed out as well as he could be. Even in the cartoon we don't really get a sense of how he came to be what he is. Johns gave us the whole "My name is Black Manta. You killed my father! Prepare to die!" thing, but even then it's shallow. I have a whole backstory in my head that goes back generations but if the comics ever really dug into Manta's history I've never seen it. Yes!!! There is sooo much more potential for this guy. As it stands: he's probably one of the few villains where he goes THERE and gets straight raw. His comic look (to me) doesn't play that...and it's gotten to the point that I prefer the helmetless BM. Young Justice, movie and JLU gave me a BM look that screamed intelligent and complex sinister in the way only brothas can do (lol). I'd love to have a mini of this guy. Maybe send him to an alternate dimension so he can really cut loose. And a comic costume redesign in 2019!!! It’s well past time that Manta got a mini series. There was a pretty good Black Manta short story in the “Beach Blanket Villains” summer special. I thought he looked super badass in the movie but didn’t get much of a chance for character development. He’s obviously going to be the main villain in the sequel. He was also pretty great in Injustice 2. Last edited by Robotman; 01-02-2019 at 01:21 PM. I liked him in the movie. One of the best parts. Probably one of my favorite fighters and mains outside of Black Canary and Sub-zero. You're going to love the movie then. In the movie we learn that his grandad was an expert frogman in WW2 who earned the codename "Manta" for his stealth. After the war he was discarded by the government (no doubt because of his race) so he turned to piracy. He taught his son everything he knew who in turn taught his son. The movie also does a better job of justifying his hate. In the comics Aquaman killed Manta's father in a fit of blind rage. In the movie he coldly leaves him to drown. Anyway, Black Manta was awesome in the movie. Yahya Abdul-Mateen II did an amazing job with him. He may not have had a lot of screen-time but what he has is great. Savage as heck. Aquaman needs to stop losing his hand, it's becoming a bad habit. Incidentally I love that Black Manta is a swordsman in the movie. Oh yeah, he was a big draw for me when he was announced, and he's one of my favorite characters on the roster. Just a great balance of abilities, nice speed, he's awesome. Nice. I gotta admit they did a much better job with the costume than I expected, from what I've seen in the trailers. Man, I love Manta. One of my favorite things about him is how he usually just skips the villainous monologue and goes straight for the throat. And really, he's one of the few villains who can claim to have really hurt the hero. Manta killing Arthur's son is right up there with the death of Jason Todd or Bane breaking Bruce's back or Doomsday killing Clark. Killing a kid is so f**king vile it sort of launches Manta way up the "scumbag villain" charts all on its own. I applaud every artist who can make Manta look intimidating because that oversized helmet can easily look silly. Like Mysterio's fishbowl. The red eye of doom, black color, the overall alien look, and the character being a butcher help though.